This was funded by Barclays Wealth and aimed to give people a taster of different skills free of charge. The project ran over 10 weeks and was a huge success, enabling 16 local residents to develop their skills in DIY, computers and Basic Skills and to build their confidence. The students were able to progress to other relevant courses at the Centre to further enhance their skills. 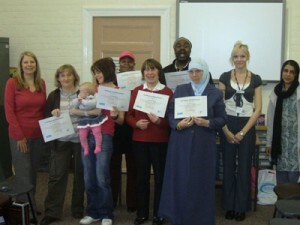 A celebration event was held at the end of the project to award certificates, toolboxes and inspirational books. This bespoke course was put on with funds raised by St John’s in partnership with Faiths4Change, Harvest Housing and Grassroots project. It was tailored to meet the needs of individuals who wished to learn how to use power tools and gain transferable skills that would enable them to refurbish pieces of furniture to save them from landfill; do some home repairs to save money; build something for the home, or – as in the case of Mel, one of the students – a kennel for her new dog. The group have transformed the neglected allotment space at the back of the building and are using a ‘poly-tunnel’ to enable all year round growing. As yet, the group is small, but they are already learning new skills and making good use of the space, and it’s wonderful to see things starting to grow – potatoes, strawberries, beetroot and onions.